I frustrate myself with my “hot mess” qualities all the time. I feel like I portray this persona like I’ve got it all together here on my blog, while in real life I sometimes feel like I’m drowning. I take pretty pictures for my Instagram, but I feel like I can’t get it together even for school drop off. No matter how much of a hot mess I may be, it’s really important for my girls to know that I love them and that they are my world. I like having them help in the kitchen, and easy, kid-friendly treats are what they really love to help with. The girls and I took to the messy kitchen and got started on some kid-friendly Christmas treats. So fun and festive – white chocolate covered grahams! 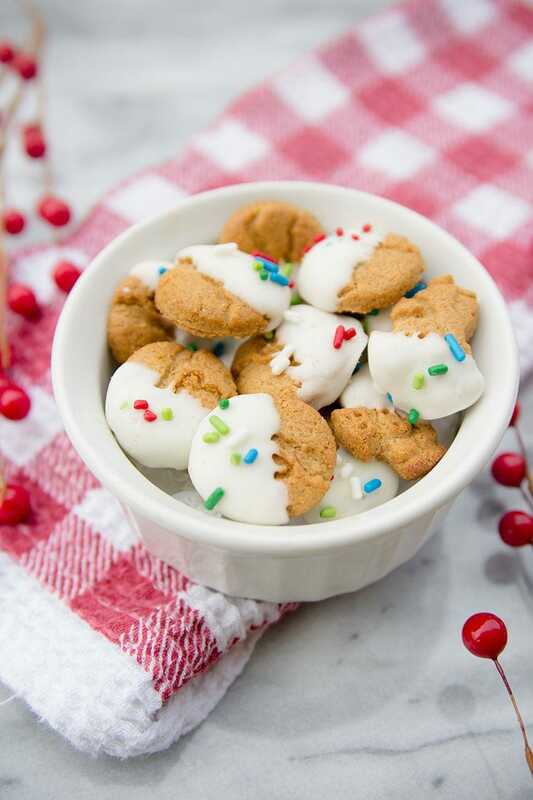 Just take your favorite Horizon Cinnamon Grahams, dip them in some melted white chocolate (I pop mine in the microwave for about 1 minute and 30 seconds), and sprinkle with some festive sprinkles! It’s totally acceptable to snack on the Horizon Cinnamon Grahams as you prepare your festive treat. As you probably know by now, they are one of our favorite snacks we keep in our home! Remember how I said I’m not crafty at all? I’m really not. I’m creative but impatient with crafts. That’s why these Horizon Mozzarella Cheese Sticks snowmen are awesome. I can feel like a Pinterest mom when I put them in the girls’ lunches, but it was so easy! Just a few sharpies and a little ribbon. My goal in 2017 is to be less of a mess, and these fun, kid-friendly Christmas treats are helping me feel inspired. Mess or no mess, I don’t know what mom isn’t about kid-friendly Christmas treats that are easy to put together. I hope you give these a try. If I can do it, so can you!